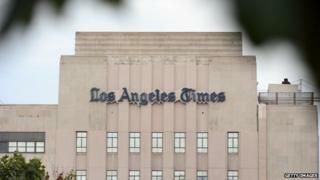 The Los Angeles Times was the first newspaper to publish a story about an earthquake on Monday - thanks to a robot writer. Journalist and programmer Ken Schwencke created an algorithm that automatically generates a short article when an earthquake occurs. Mr Schwencke told Slate magazine that it took around three minutes for the story to appear online. "Robo-journalism" is increasingly being used in newsrooms worldwide. The LA Times is a pioneer in the technology which draws on trusted sources - such as the US Geological Survey - and places data into a pre-written template. This is the article generated by the LA Times algorithm: A shallow magnitude 4.7 earthquake was reported Monday morning five miles from Westwood, California, according to the U.S. Geological Survey. The temblor occurred at 6:25 a.m. Pacific time at a depth of 5.0 miles. According to the USGS, the epicenter was six miles from Beverly Hills, California, seven miles from Universal City, California, seven miles from Santa Monica, California and 348 miles from Sacramento, California. In the past ten days, there have been no earthquakes magnitude 3.0 and greater centered nearby. Read the newspaper's full report here. As well as the earthquake report, it also uses another algorithm to generate stories about crime in the city - with human editors deciding which ones need greater attention. Other news organisations have experimented with algorithm-based reporting methods in other areas, particularly sports. The generated story does not replace the journalist, Mr Schwencke argued, but instead allows available data to be quickly gathered and disseminated. "It's supplemental," he told the magazine. "It saves people a lot of time, and for certain types of stories, it gets the information out there in usually about as good a way as anybody else would. "The way I see it is, it doesn't eliminate anybody's job as much as it makes everybody's job more interesting."